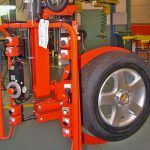 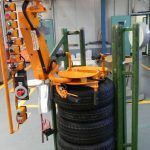 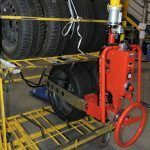 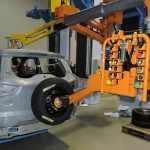 Dalmec gripping systems for handing car tyres – rubber wheels. 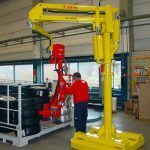 Dalmec is specialized in handling loads of all sizes and materials with a weight from 5 Kg to 900 Kg. 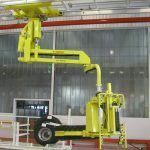 Dalmec gripping systems are present in the major car companies all over the world. 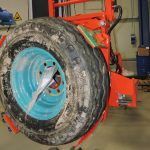 Dalmec engineers and consultants have the necessary know-how to work with you during the whole process, from conception and design to the implementation of a new sector solution. 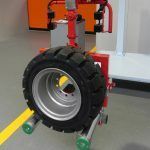 Manipulator Partner type equipped with mandrel gripping system tohandle and position wheels on the vehicle tailgate. 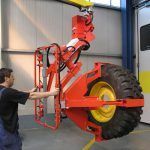 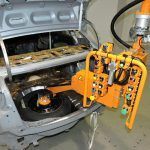 Dalmec lifting arms – manipulators for the car-motorcycle industry are custom-built, with specially adapted design, dimensions and picking systems to suit the specific requirements of the users and the various environmental conditions available.